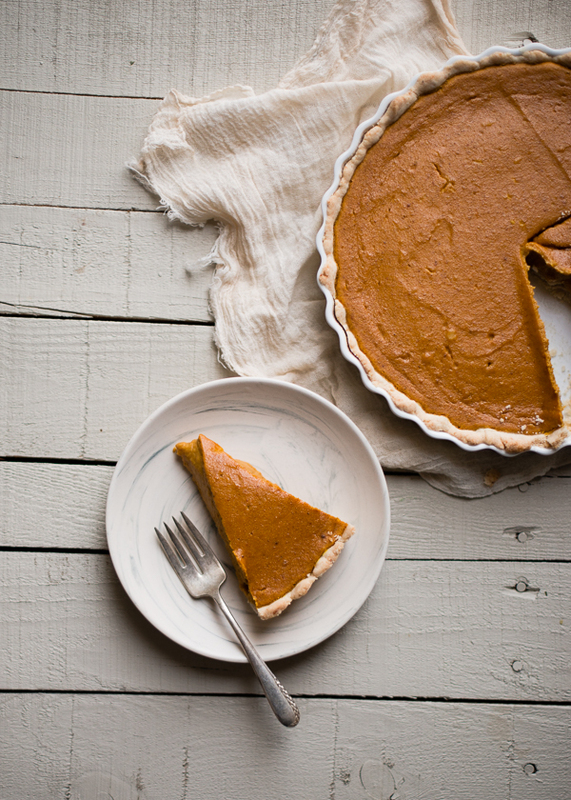 Pumpkin pie lovers fall into two (maybe three) camps – purists and adventurists. At least that’s the case in my family. My husband was abhorred by the idea of changing up the yearly pumpkin pie(s) until I started baking and he started tasting. We used almost-burnt caramel as a base one year. Another the pie was topped with streusel (and made with caramel). Another pie was a Thanksgiving Two-fer ala Dorie Greenspan. (Think: double layers or pumpkin AND pecan pie. Amazing!) There have been cheesecake-ish pies. And pumpkin cream pies. And then I decided to attempt the nearly impossible (if you ask my husband) and test out a recipe for a vegan pumpkin pie. Now this isn’t anything new. You’ll find pumpkin pies of all kinds out there in a simple internet search. The pie I wanted to make involved coconut cream and curry powder. Just to see what it would taste like. A sort of pumpkin pie experiment. What do you think? Would you try it? 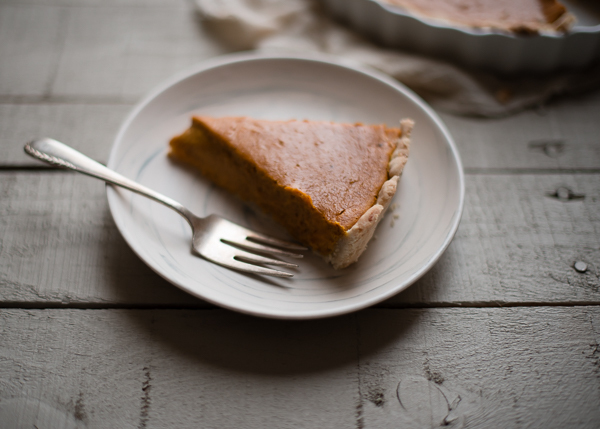 Would you sacrifice a good old fashioned pumpkin pie on the chance that adding curry powder might be just the thing you never knew you wanted on your dessert plate? Hmm. I was curious. Before I jump into the spicy details of a curried pumpkin pie, be sure to check out Becky’s gorgeous Cranberry Cherry Galette on her blog today. 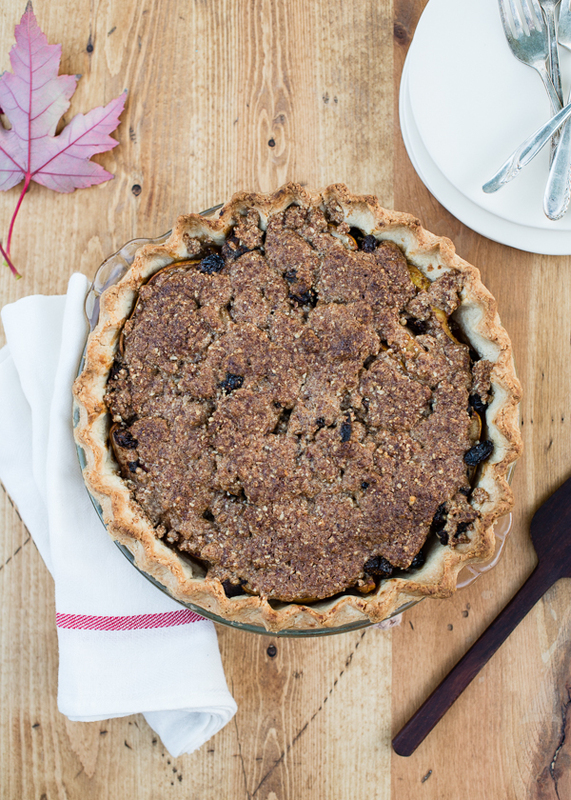 Each month we team up to share recipes based on a theme, and this month is all about pie! 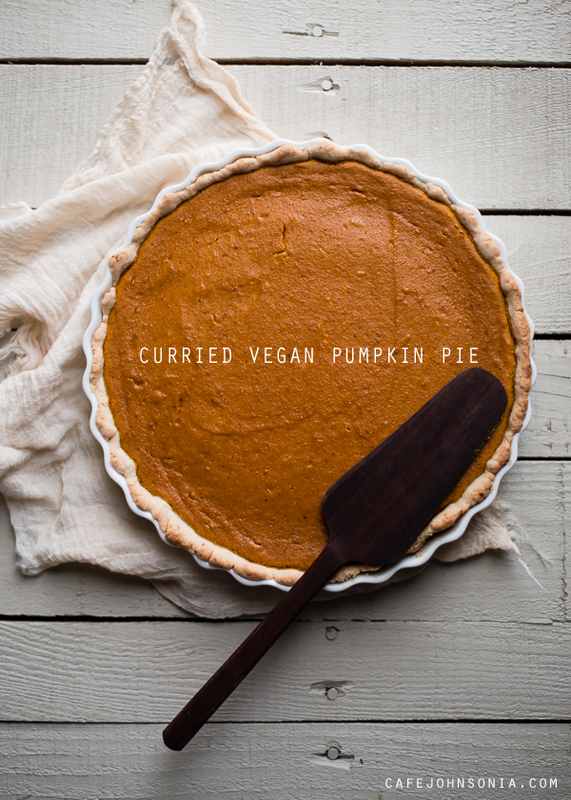 Now, I did my research on vegan pumpkin pies because I wasn’t quite sure what I wanted to use as an egg replacement. Some pies used silken tofu, which was fine. Others were more of a pudding. And then I came across one that was thickened with arrowroot starch (or powder). And that sounded like what I was looking for. One thing I don’t love about traditional pumpkin pies is that they are too sweet for my taste. I prefer them just a step above savory. So, I think that’s another reason this particular recipe was suited to that touch of curry powder. Spoiler alert: this pie is kind of amazing in a strange, alluring way. 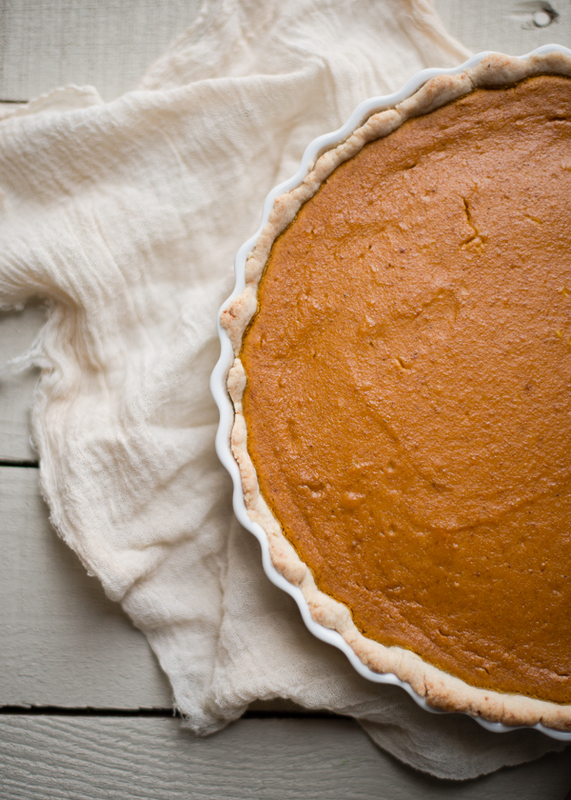 The filling is indeed softer and creamier than your typical pumpkin pie. I prefer a softer texture, though by adding more arrowroot, the filling would definitely firm up more. 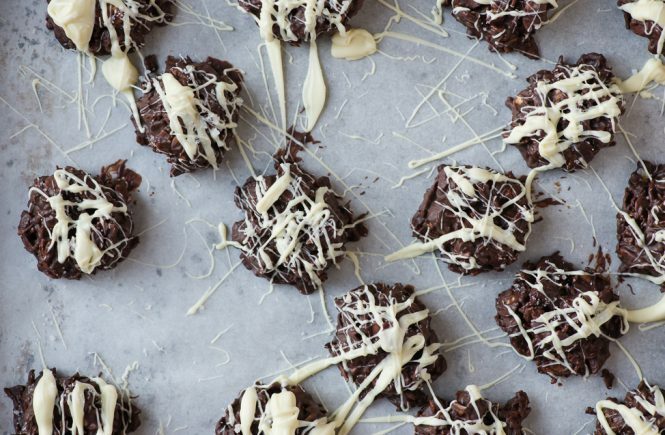 The coconut cream makes it so rich and creamy. If you’re used to a pie made with evaporated milk, you’re in for a treat. But then I think coconut cream would make just about anything taste fantastic. (And you can quote me on that.) I didn’t want to go overboard with the curry. Not all curry powders are created equal. We’ve found a brand that’s available at most Asian markets and some grocery stores that has just the right amount of kick. No one spice in the powder overshadows the others. It’s a nicely balanced powder. I think choosing a curry powder is a highly personal decision. (You can quote me on that too!) There was a nice spicy note at the end of every creamy, pumpkin-y bite, but it was not overpowering. I used my own blend of pumpkin pie spice too. It really was a fun experiment and I’m looking forward to finishing the last slice for breakfast. Ah, curry. I just can’t quit you. 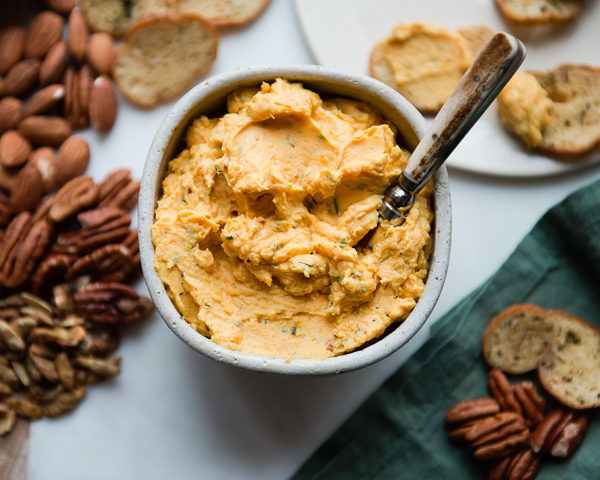 A twist on the classic Thanksgiving dessert with a spicy kick from curry powder. For crust: Place the gluten-free flour mix, almond meal, sugar, and salt in the bowl of a food processor. Pulse until combined. Drop small spoonfuls of the chilled shortening over the top of the dry ingredients. Pulse about 10 times, or until the mixture resembles cornmeal with some larger pieces remaining. With the food processor running on low (or using the pulse button), drizzle the water a little at a time through the feed hole. Stop at 4 Tablespoons and remove lid. Press dough together. If it sticks, leave out the last tablespoon. If not, drizzle it over the dough and pulse a few times until combined. 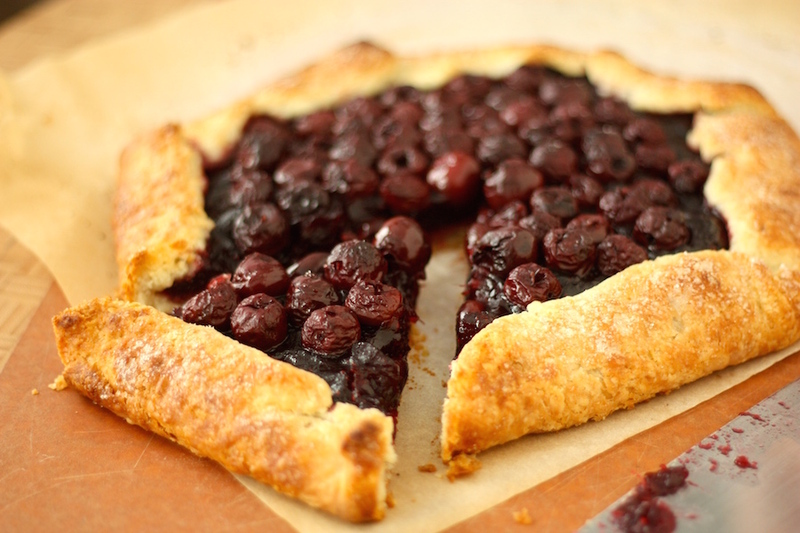 Transfer the dough to a 10-inch tart pan. (I used ceramic, metal is fine. A pie plate can also be used.) Press the dough up the sides and evenly over the bottom. Set aside. Pour the filling into the tart shell. Bake at 425°F for 15 minutes, then lower head to 300°F and bake for another 35-40 minutes, or until the center of the pie is set. It will be a little bit jiggly and finish setting up as it cools. 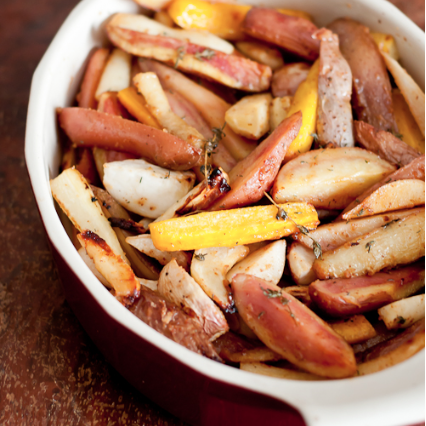 Cool completely at room temperature, then refrigerate until ready to serve. -For a true pie, extend the 350°F baking time by about 10 minutes. -If you aren't vegan or dairy-free, heavy cream can be used in place of the coconut cream. -If you aren't gluten-free, regular all-purpose flour can be used in place of the GF all-purpose flour. -Butter or chilled ghee can be used instead of shortening. -Omit curry powder for a more traditional pumpkin pie. I love strange, alluring ways when it comes to dessert qualities. Love teaming up with you. This looks like a winner and I’m glad to have delicious dessert options for special dietary needs. I love this idea! 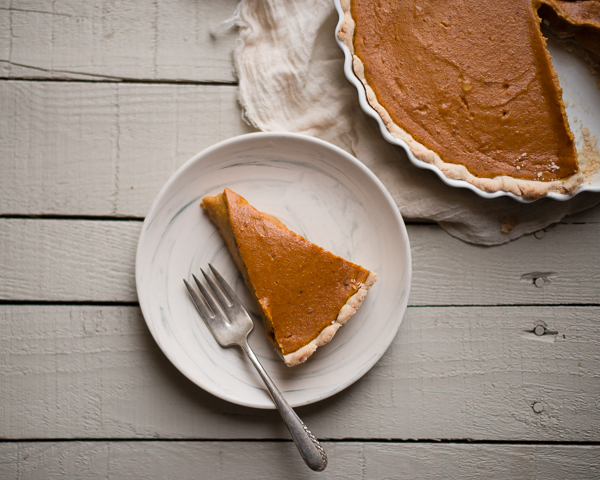 I’m with you on preferring my pumpkin pie not too sweet, and I love sweet and savory together. 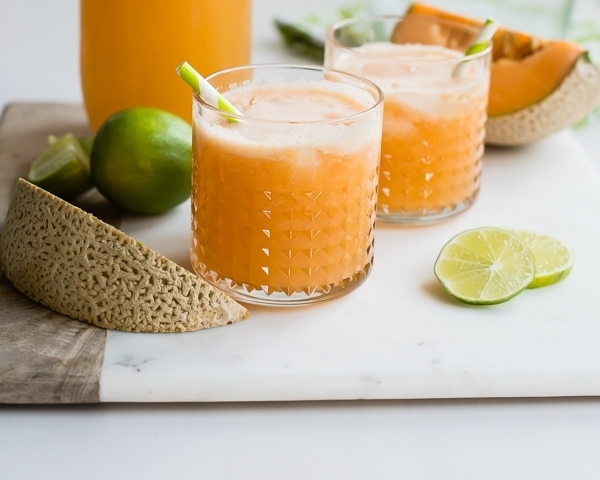 This sounds like my kind pf pumpkin pie – I’ll definitely be making it some time over the holiday season.